The 1967 Mustang was completely revamped in 1967 by Ford. It was longer and wider, but it had the same 108 inch wheelbase of its predecessor, the 1965 & 1966 Mustang. The grille opening was enlarged for a more aggressive look, while the rear taillight panel was concave. The 1967 fastback became a full fastback, and simulated rear quarter panel scoops were used on all three of the body styles. 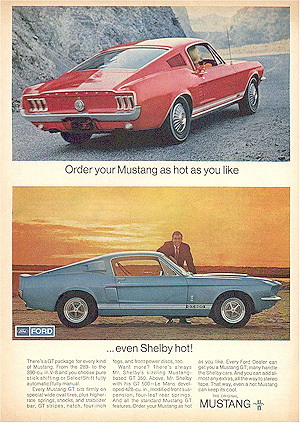 Are you a proud owner of a brand new stang and looking to get the retro look of the early models? Then check out all the 2011 Mustang parts here. The front suspension was widened and redesigned which resulted in a better ride for the 1967 Mustang. The optional front disc brakes came with power assist, and the Mustang was the first to be using a dual hydraulic braking system. Customize your Mustang with some aftermarket ford mustang body kits or Mustang HID lights. Engine selection remained the same as in the 1966 Mustang, but with one major exception. The 390 cubic inch big block was introduced which was rated at 320 horse power. It brought serious performance to the Mustang. The 390 used cast iron intake and exhaust manifolds. Carburetion was a single 600 cfm Holley four-barrel. All 390 engines installed in the Mustang was dual exhaust. A total of 28,800 Mustangs were equipped with the 390 engine. The premier performance model was still the Mustang GT. The GT Equipment Package consisted of the grille-mounted fog lamps, power front disc brakes, dual exhausts with chrome quad outlets (excluded on the 200 hp 289 models), F70x14 tires, GT gas cap, the handling package, rocker panel stripes, and GT or GTA (for automatic transmission equipped GTs) emblems. A total of 24,079 models were equipped with the Mustang GT option. Available only with the GT Equipment Package was the Competition Handling Package, consisting of firmer suspension components, limited slip rear axle and fifteen-inch wheels with wire wheel covers. The interior was also redesigned in 1967. Most noticeable was the new dash, which did away with the Ralley-Pac and also featured air conditioning. The Tilt-away steering wheel was a new option, as was the fold-down rear seat on the fastback models. Other new options included cruise control, a folding glass rear window on the convertible and an Exterior Decor Group which included a hood with rear-facing louvers that housed turn signal indicators, wheelwell moldings and a pop-open gas cap. The Interior Decor Group option did not include the galloping Pony inserts. As with precious Mustangs, there was a long list of dealer installed options which included the Cobra kits. With these kits, the Mustang enthusiast could improve performance from mild to beyond wild!